Abstract: We examined the cross-lagged relations between word reading fluency in the two orthographic systems of Japanese: phonetic (syllabic) Hiragana and morphographic Kanji. One hundred forty-two Japanese-speaking children were assessed on word reading fluency twice in Grade 1 (Times 1 and 2) and twice in Grade 2 (Times 3 and 4). Nonverbal IQ, vocabulary, phonological awareness, morphological awareness, and rapid automatized naming were also assessed in Time 1. Results of path analysis revealed that Time 1 Hiragana fluency predicted Time 2 Kanji fluency after controlling for the cognitive skills. Time 2 Hiragana fluency did not predict Time 3 Kanji fluency or vice versa after the autoregressor was controlled, but Hiragana and Kanji fluency were reciprocally related between Times 3 and 4. These findings provide evidence for a cross-script transfer of word reading fluency across the two contrastive orthographic systems, and the first evidence of fluency in a morphographic script predicting fluency development in a phonetic script within the same language. Abstract: Nonadjacent dependency learning is thought to be a fundamental skill for syntax acquisition and often assessed via an offline grammaticality judgment measure. Asking judgments of children is problematic, and an offline task is suboptimal as it reflects only the outcome of the learning process, disregarding information on the learning trajectory. Therefore, and following up on recent methodological advancements in the online measurement of nonadjacent dependency learning in adults, the current study investigates if the recording of response times can be used to establish nonadjacent dependency learning in children. Forty-six children (mean age: 7.3 years) participated in a child-friendly adaptation of a nonadjacent dependency learning experiment (López-Barroso, Cucurell, Rodríguez-Fornells, & de Diego-Balaguer, 2016). They were exposed to an artificial language containing items with and without nonadjacent dependencies while their response times (online measure) were measured. After exposure, grammaticality judgments (offline measure) were collected. The results show that children are sensitive to nonadjacent dependencies, when using the online measure (the results of our offline measure did not provide evidence of learning). We therefore conclude that future studies can use online response time measures (perhaps in addition to the offline grammaticality judgments) to further investigate nonadjacent dependency learning in children. Abstract: Morphological awareness (MA) is an important predictor of reading outcomes in different languages. The consonantal root is a salient feature of Arabic lexical structure and critical to MA. The goals of this study were to (a) develop a measure of root awareness (RA) as one dimension of MA in Arabic, and (b) validate the RA measure by predicting reading outcomes in an Arabic population. A set of RA items was administered to 194 Arabic-speaking third-grade children. A one-factor model was specified using confirmatory factor analysis to examine the model fit of the RA measure. A structural equation model was then developed to examine the relation between the RA measure and important reading outcome measures including word reading, reading fluency, and reading comprehension. The results of these analyses indicated good model fit, and the RA measure accounted for a substantial portion of the variance in the outcomes. The establishment of the RA measure is an important preliminary step to efficiently assessing MA in Arabic and could serve as an integral tool for studying reading development. Abstract: Decoding and language comprehension skills have been found to be the core components of reading comprehension across many writing systems. The present study examined the contributions of vocabulary and some discourse-level skills to reading comprehension in Chinese in addition to that of decoding. One hundred and seventeen Chinese second and third graders in Hong Kong were tested on decoding, vocabulary, discourse-level skills, and verbal working memory. Results of multiple regression analyses showed that the discourse-level skills contributed an additional 5% of variance to reading comprehension over decoding, vocabulary, and other control variables, and all factors accounted for a total of 70% variance in reading comprehension. Further path analysis showed that all the direct paths of word reading, vocabulary, text-structure knowledge, and topic knowledge to reading comprehension were significant. Vocabulary also contributed to reading comprehension through indirect paths to discourse-level knowledge. The present findings support the simple view of reading with elaborations on the language comprehension component, namely, (a) vocabulary is a foundational language skill for text comprehension through its role on discourse-level knowledge, and (b) some discourse-level knowledge also plays an important role in passage comprehension. Abstract: In two semantic priming experiments, this study examined how southern French speakers process the standard French [o] variant in closed syllables in comparison to their own variant [ɔ]. In Experiment 1, southern French speakers showed facilitation in the processing of the associated target word VIOLET whether the word prime mauve was pronounced by a standard French speaker ([mov]) or a southern French speaker ([mɔv]). More importantly, Experiment 1 has also revealed that words of type mauve, which are subject to dialectal variation, behave exactly in the same way as words of type gomme, which are pronounced with [ɔ] by both southern and standard French speakers, and for which we also found no modulation in the magnitude of the priming effect as a function of the dialect of the speaker. Experiment 2 replicated the priming effect found with the standard French variant [mov], and failed to show a priming effect with nonwords such as [mœv] that also differ from the southern French variant [mɔv] by only one phonetic feature. Our study thus provides further evidence for efficient processing of dialectal variants during spoken word recognition, even if these variants are not part of the speaker’s own productions. Abstract: Understanding alternatives to prominent information contributes to successful native language discourse comprehension. Several past studies have suggested that the way second language (L2) learners encode and represent an alternative set in L2 speech is not exactly native-like. However, because these studies involved contrastive pitch accents in running speech, these native language–second language differences may reflect the demands of comprehending running speech in L2 rather than intrinsic deficit in discourse processing per se. Here, we tested L2 learners’ discourse encoding and representation using a different cue to prominence: font emphasis in self-paced reading. We found that, in this temporally less demanding modality, L2 learners’ encoding of salient alternatives became native-like. Font emphasis facilitated L2 learners’ memory for the discourse by ruling out salient alternatives, just as how it facilitates native speakers’. L2 learners were also similar to native speakers in using the situation model to constrain an alternative set. The results suggest that L2 learners can show native-like processing of prominence and that previous underuse of contrastive accents in L2 comprehension could reflect cognitive demands of processing running speech in L2. Abstract: In two reading experiments involving a self-paced reading task, we explored how literariness affects initial stages of incidental vocabulary acquisition during reading in second language German. In Experiment 1, literariness was operationalized along the formalist, language-driven approach, focusing on the role of literary devices and their assumed ability to draw readers’ attention to the verbal message itself. In Experiment 2, we included conventions related to reading fiction (book title, author name, and year of publishing) to modulate the reader’s mode of text processing, which defines literariness according to reader-driven approaches (e.g., reception theory). Contrary to the expectations based on the noticing hypothesis (Schmidt, 2012), we did not observe any advantage for incidental vocabulary acquisition in literary texts compared to nonliterary ones. However, in accordance with claims taking into account the limits of cognitive resources, we found evidence that acquisition of unknown words is impeded, if these directly participate in a literary device. Abstract: Spelling is a key, and telling, component of children’s literacy development. An important aspect of spelling development lies in children’s sensitivity to morphological root constancy. This is the sensitivity to the fact that the spelling of roots typically remains constant across related words (e.g., sing in singing and singer). The present investigation examined the extent to which children with dyslexia and younger typically developing children are sensitive to this feature of the orthography. We did so with a spelling-level matched design (e.g., Bourassa & Treiman, 2008) and by further contrasting results with those for a sample of children of the same chronological age as the dyslexic group. Analyses revealed that the dyslexic children and their spelling-ability matched peers used the root constancy principle to a similar degree. However, neither group used this principle to its maximum extent; maximal use of root constancy did emerge for age matched peers. Overall, the findings support the idea that sensitivity to root constancy in children with dyslexia is characterized by delayed rather than atypical development. Abstract: Verbal fluency tasks, in which participants generate words during a set time, have been used in research and assessments of neurobiological disorders and impairments. Research on verbal fluency in dyslexia has shown impaired performance in semantic and letter fluency. However, studies report inconsistent results, and action fluency has not been examined in dyslexia. Current research has mainly examined verbal fluency in relation to executive functions, vocabulary, and phonological processing. The present study examined performance on letter, semantic, and action fluency in relation to reading ability in 42 students in higher education, of which 16 had developmental dyslexia and 26 had typical reading development. It was examined if verbal fluency can predict variance in reading ability when group, phonological awareness, and rapid automatized naming are controlled for. Results showed impaired verbal fluency in the developmental dyslexia group. Action fluency and group were significant predictors of reading ability, together explaining 73% of the variance, in a backward elimination regression analysis. The results point to a possible, unique connection between action fluency and reading ability; this connection is discussed based on their neurocognitive underpinnings. Abstract: We evaluated the impact of gestures on second language (L2) vocabulary learning with nouns (Experiment 1) and verbs (Experiment 2). Four training methods were compared: the learning of L2 words with congruent gestures, incongruent gestures, meaningless gestures, and no gestures. Better vocabulary learning was found in both experiments when participants learned L2 words with congruent gestures relative to the no gesture condition. This result indicates that gestures have a positive effect on L2 learning when there is a match between the word meaning and the gesture. However, the recall of words in the incongruent and meaningless gesture conditions was lower than that of the no gesture condition. This suggests that gestures might have a negative impact on L2 learning. The facilitation and interference effects we found with the use of gestures in L2 vocabulary acquisition are discussed. Abstract: Theories of reading development generally agree that, in addition to phonological decoding, some kind of orthographic processing skill underlies the ability to learn to read words. However, there is a lack of clarity as to which aspect(s) of orthographic processing are key in reading development. We test here whether this is orthographic knowledge and/or orthographic learning. Whereas orthographic knowledge has been argued to reflect a child’s existing store of orthographic representations, orthographic learning is concerned with the ability to form these representations. In a longitudinal study of second- and third-grade students, we evaluate the relations between these two aspects of orthographic processing and word-reading outcomes. The results of our analyses show that variance captured by orthographic knowledge overlaps with that of word reading, to the point that they form a single latent word-reading factor. In contrast, orthographic learning is distinctive from this factor. Further, structural equation modeling demonstrates that early orthographic learning was related to gains in word reading skills. We discuss the implications of these findings for theories of word-reading development. 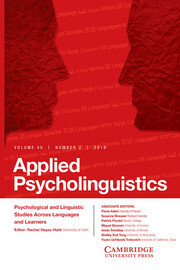 Abstract: Familiarity, emotionality, motor activity, memorability, and vividness of visual imagery ratings, on 7-point scales, were collected for 536 Spanish action-related sentences, including a corpus of 439 phrases originally normed in Swedish, German, and Croatian (Arar & Molander, 1996; Molander & Arar, 1998; Molander, Arar, Mavrinac, & Janig, 1999) and 97 new sentences describing actions usually performed using different body postures and face or hand movements. These norms constitute the only available set of ratings for action sentences in Spanish including those dimensions to date, and they allow for the design of studies aimed at empirically exploring the relationship between action, language, and cognition with well-controlled materials in Spanish-speaking samples of participants. Abstract: Previous research investigating the relationship between language proficiency and iconic gesture use has produced inconsistent findings. This study investigated whether a linear relationship was assumed although it is a quadratic relationship. Iconic co-speech gesture use by 4- to 6-year-old French–Japanese bilinguals with two levels of French proficiency (intermediate and low) but similar levels of Japanese proficiency was compared with that of high-proficiency French monolinguals (Study 1) and Japanese monolinguals with similar proficiency to the bilinguals (Study 2). To control the information participants communicated, a dynamic referential communication task was used; a difference between two cartoons had to be communicated to an experimenter. Study 1 showed a significant quadratic relationship between proficiency and iconic gesture use in French; the intermediate-proficiency bilinguals gestured least among the three proficiency groups. The monolingual and bilingual groups with similar Japanese proficiency in Study 2 gestured at similar rates. It is suggested that children gestured for different reasons depending on their language proficiency and the cognitive resources available for the task. Abstract: Most current models of nonnative speech perception (e.g., extended perceptual assimilation model, PAM-L2, Best & Tyler, 2007; speech learning model, Flege, 1995; native language magnet model, Kuhl, 1993) base their predictions on the native/nonnative status of individual phonetic/phonological segments. This paper demonstrates that the phonotactic properties of Japanese influence the perception of natively contrasting consonants and suggests that phonotactic influence must be formally incorporated in these models. We first propose that by extending the perceptual categories outlined in PAM-L2 to incorporate sequences of sounds, we can account for the effects of differences in native and nonnative phonotactics on nonnative and cross-language segmental perception. In addition, we test predictions based on such an extension in two perceptual experiments. In Experiment 1, Japanese listeners categorized and rated vowel–consonant–vowel strings in combinations that either obeyed or violated Japanese phonotactics. The participants categorized phonotactically illegal strings to the perceptually nearest (legal) categories. In Experiment 2, participants discriminated the same strings in AXB discrimination tests. Our results show that Japanese listeners are more accurate and have faster response times when discriminating between legal strings than between legal and illegal strings. These findings expose serious shortcomings in currently accepted nonnative perception models, which offer no framework for the influence of native language phonotactics.